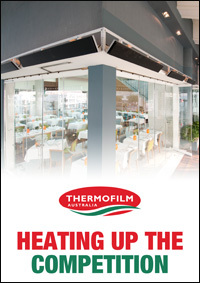 Thermofilm is a manufacturer, designer and supplier of innovative electric indoor and outdoor heating products. When the company began in 1988, they used a thin carbon-based heating element in their early products, – and when the company was searching for a name – they thought to highlight that feature. However, the company has now grown well beyond those initial products. Based in Melbourne, the company has over 25 years of operational experience. In that time, they have expanded to reach into other markets across the globe. Today, Thermofilm and Heatstrip is a recognisable brand and is supplied to international markets including Europe, USA and Canada. Innovation has hallmarked their creations, and has placed Thermofilm on the cutting edge within their industry. As the market has developed, Trezise says that Thermofilm was able to grow and modify their product range in order to meet the new demands of the industry, of customers and Government policy . Over the life of the company, their major clients have been in the commercial sector, where they have been supplying radiant heaters and convective panel heaters to apartments, schools, hospitality and many other large projects. Over time, however, they have diversified and broken into the residential/home improvement market – which has allowed them to offer their products to a whole new set of customers and retailers. Thermofilm’s main product is called the Heatstrip – which is an Australian-made range of premium, high-intensity electric radiant heaters suitable for both tough indoor and outdoor applications. The Heatstrip is mounted to the ceiling to allow for radiant heating, and is both stylish and energy efficient. 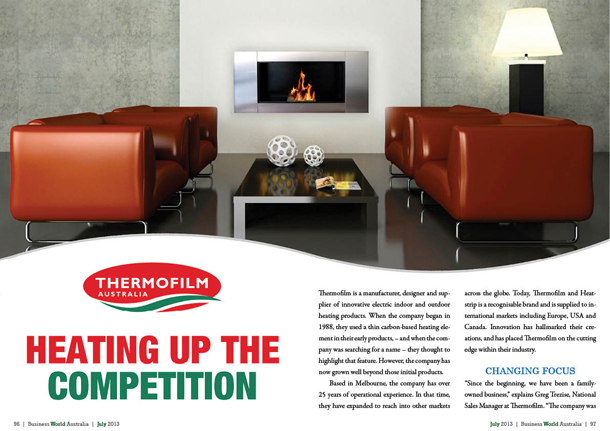 Thermofilm’s size provides the company with an added advantage over their competitors. Because they are a small-to-medium sized business, they are able to react quickly and able to turn market changes into business opportunities within the market – as seen by their recent refocusing on residential outdoor heating/alfresco applications with the Heatstrip. 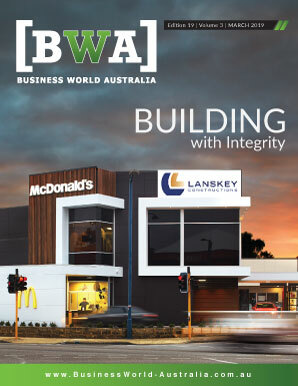 Many larger companies have an unchanging catalogue that stymies them when the industry changes as much as it has in Australia. Trezise stresses that this does not mean they do a rushed job, and says that even as they move quickly, their attention to design and quality is never compromised. An added advantage is having local resources that can respond to local markets. This includes engineering, product design, testing and manufacturing capabilities, based in the Melbourne Head Office. The flagship Heatstrip Classic range of electric radiant heaters has been designed, engineered and assembled in Melbourne, and exported throughout the world. Thermofilm is also a leader in energy-efficiency, which is another point of difference. Unlike other companies – who struggled with the new legislations and the customer shift to more environmentally friendly options – Thermofilm has always offered energy-efficiency. In fact, they have always designed into their products from the beginning.